The film on view is “Taras Bulba”, a new screen adaptation of the legendary Ukrainian writer Mykola Hohol’s (the common Russian transliteration being “Nikolai Gogol”) great novella of the same name and a film that chooses to use Hohol/Gogol’s pro-Russian version as its base rather than his original manuscript published prior to his subjugation where he bowed to the will of Czarist Russia to deliver a product more in keeping with the country’s own version of Manifest Destiny throughout Eastern Europe. Propaganda in the cinema is nothing new. In fact, many knee-jerkers will look for any excuse to trash Hollywood for this very thing. Since its very beginnings, a common charge against Uncle Sam’s cinema has been the preponderance of propagandistic elements to extol the virtues of truth, glory and the capitalistic American way in terms of cultural/political superiority and to defend the country’s constant need to engage in warfare. One cannot disagree with this common assertion; however, America ALONE has not propagated the myths of their “superiority” using the most powerful medium of artistic expression – the cinema. The most common example of this would be the vicious work of Nazi Germany’s Minister of Propaganda Joseph Goebbels, who utilized cinema to spread anti-Semitism with “The Eternal Jew”, a foul “documentary” that goes so far as to trace and equate the spread of Judaism with that of rats and the spread of the Black Plague. Of course, no mention of Nazi propaganda would be complete without referring to the work of the brilliant Leni Riefenstahl – a truly great artist who delivered one of the most stunning, yet reviled works of the 20th century, her stirring document of the Nuremburg Rallies, “The Triumph of the Will”. The new version of “Taras Bulba” received a substantial portion of its financing from the Russian Ministry of Culture and while it may bear the trademarks of typical old-Soviet-style propaganda, it is hardly a work that bears the hallmarks of superior filmmaking. At least Eisenstein, Riefenstahl and any number of American directors who generated similar propaganda (Steven Spielberg with “Saving Private Ryan” is a good example) are great artists who created landmarks of cinema that expanded the boundaries of the medium. The mediocre, though clearly competent television director Wolodymyr Bortko (who prefers the Russian transliteration “Vladimir” in spite of his Ukrainian heritage) serves up some sumptuous production value, elicits some fine performances and seasons his celluloid broth of borscht with all the clichés of epic cinema, but none of the depth one might find in the work of masters of the elephantine genre like David Lean. Bortko’s screenplay adaptation unimaginatively catalogues, almost by rote, the events of Hohol/Gogol’s Russified version of the novella, but somehow manages to completely miss the spirit of the original writing. Telling the classical tale of a Cossack Chief, Taras Bulba (majestically portrayed by the great Ukrainian actor Bohdan Stupka) who sends his beloved sons Andriy (Ihor Petrenko) and Ostap (Vladimir Vdovichenkov) to the Polish-ruled university in Ukraine’s capitol city Kyiv to not only get a well rounded education, but to acquaint them with the “enemy”. He eventually takes his sons to the legendary Cossack “Sich” (fortress) of Zaporozhia to train them in the skill of Cossack barbarism. Bulba’s hatred for Poland flares even more intensely when he learns that his farm has been destroyed and his wife is murdered by the Poles. He manages to get the Cossack nation to march against Poland and soon the Ukrainians are wreaking havoc and decimating their Polish rulers. Things come to a head when Bulba and the Cossacks attack the Ukrainian city of Dubno which is under Polish rule. Unbeknownst to our title character, when Bulba’s most beloved son Andriy was at school in Kyiv, he fell in love with Elzhbeta (the eye-poppingly stunning Magdalena Mielcarz) a member of Polish royalty. As bad luck would have it, her father is now the governor of Dubno and Andriy realizes that he is laying siege to the city of his beloved. Love, it would seem, becomes the ultimate enemy as Andriy betrays his country and father to be with her. It’s a great story! One of its biggest fans was Ernest Hemingway who proclaimed its genius whenever he could. Too bad, then, that this film version is so by-the-numbers. That said, even a mediocre rendering such as this one is no match for the power of Hohol/Gogol’s literary prowess and for this we are dealt some tender mercies. Finally though, the movie is a bit of a slog – plodding along its way, but without any of the spark of the original writer. In fact, the tone of the movie is resolutely dour. This is no surprise since screenwriter-director Bortko has chosen to amplify the Russified version of the novella. Without that glorious spark of Hohol/Gogol’s wonderful sense of boys’ adventure and his delightfully, deliciously and resolutely Ukrainian sense of humour, the movie has all the spark of a funeral dirge. By over-emphasizing the Russification of the original text what we have is a brutal glorification of Russian superiority. This grotesque mockery of a story that, in actuality is a rousing depiction of Ukraine’s never-ending fight for freedom from subjugation leaves us with a very foul taste in our mouths. We are handed one ultra-violent set piece after another – all in the service of boosting Russia’s own notion of might as right. By appropriating this very Ukrainian story by one of its great writers and turning it into grotesque Russian propaganda to try and suggest that the Cossacks and in turn, the Ukrainians, consider themselves little more than barbarians doing the bidding of those who would subjugate, exploit and even perpetrate genocide against them (as Stalin did) is thoroughly reprehensible. Even the occasional guarded loyalty the Zaporozhian Cossacks paid to the Russian Empire was betrayed by both Czar Peter I and Catherine the Great who respectively destroyed the Zaporozhian Sich and forced them to scatter and disband or face death. None of this would have been lost on Gogol - especially with his first, but suppressed edition of the novel and even within the Russified version, this healthy distrust of the Empire boils just below the surface. Bortko’s mediocrity as a director reaches its nadir, however, in his lame handling of the fighting, action and battle scenes which is, in a word, dull. With fabulous locations, thousands of extras and impeccable production and costume design, he cannot direct action. His shooting style is cudgel-like, but it never has the thrilling and freewheeling quality the action needs. Bortko appears to have everything that money can buy – everything that is, except the genuinely distinctive artistic voice that would allow him to rise above his own mediocrity. I do reiterate, though, that such propagandistic shenanigans would ultimately not be as problematic if this was actually a good movie, but it isn’t. Saddled with a clumsy flashback structure, a lazy use of prose narration from the novel and a dull television-mini-series mise-en-scene, “Taras Bulba” might stir the loins of Putin-lovers-and-apologists, but it doesn’t come close to mining the stirring potential of the story. Let’s not forget that Hohol/Gogol came from Cossack stock and that he was inspired by the very moving Ukrainian nationalist “dumy” (folk ballads) of the Cossacks themselves. Also, one of Hohol/Gogol’s chief literary inspirations was the great Scottish writer Sir Walter Scott and that “Taras Bulba” was conceived as a Ukrainian version of those swashbuckling tales of Scottish Highlanders battling their British oppressors/occupiers (especially notable in "Rob Roy"). A cool historical footnote is that Cossacks themselves might have had some roots in Scotland at a much earlier historical juncture. Another interesting correlation between Scott and Gogol is that both portrayed strong, sympathetic Jewish characters in their respective swashbucklers - Scott created Rebecca in "Ivanhoe" and Gogol gave us Yankel in "Taras Bulba". In fairness to Bortko, however, his screenplay, unlike the Hollywood version restores the odd symbiotic friendship from Hohol/Gogol’s novella between Bulba and the Jewish money lender Yankel (yielding a stellar performance by Sergei Dryden) and, most importantly, the whole aftermath involving the capture, torture and execution of Ostap at the hands of the Poles and Bulba’s revenge and final noble sacrifice. These are all stirring story beats and while I am grateful for their inclusion, I am less grateful that they are present almost solely to provide Russian propaganda. 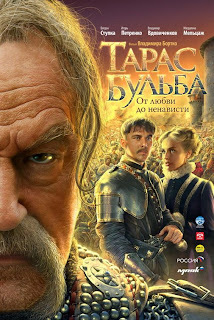 This new version of “Taras Bulba” no doubt has poor Hohol/Gogol spinning in his grave. I’m sure he never would have imagined that so many generations later his work would be bastardized as a piece of propaganda for the country that even now seeks to consume his Motherland whole and tries continually to repress its spirit, culture, language and people. Is the 1835 version of the novel available in English ? Alas, teenage buffalo, there has never been a proper English translation of the 1835 version of "Taras Bulba" - at least not to my knowledge (and if anyone can point me in the direction of one, I'd be most obliged). The Russified rewrite from 1842 became the version that all translations have been based upon. That said, the Russified version appears to have a much more stirring ending than the 1835 version which does not end with Bulba's death. Also, there is a new Ukrainian translation, but it appears to be problematic in that it erases all references to "Rus" or "Muscovy"(as opposed to the more contemporary "Russia")which would have gone against Gogol/Hohol's intentions. It also does not feature the more historically accurate and colourful dialects which would have been a blend of Ukrainian and Russian. This is one of the unfortunate aspects of the 2009 film version because it also does not feature any of the proper dialect and it seems more than a bit erroneous to allow all the Polish characters to speak in Polish, but doesn't allow the Ukrainian characters to speak Ukrainian, or even the dialectic blending of the two.